I’ve already written about Allan Brew and his classic motorbikes in a previous article but I thought that readers of my blog might be interested in a little history behind the Isle of Man being a world center for motorbike racing. According to Isle of Man TT website it all began in 1903 when mainland Britain imposed a 20mph (32kph) speed limit on the public highway. So Sir Julian Orde, the Secretary of the Automobile Club of Great Britain and Ireland, came to the Isle of Man hoping they would allow road racing. His wishes came true and in 1904 the The Highways (Light Locomotive) Act was passed by the local legislature. Car and motorike races followed, and in 1911 the first Isle of man Tourist Trophy (TT) race took place on the Snaefell mountain course. The American motorbike manufacturer Indian took the first three places. You might be interested to note that in 1920 the lap record was 55mph (88kph), but by 2009 had reached an incredible 131mph (210kph). 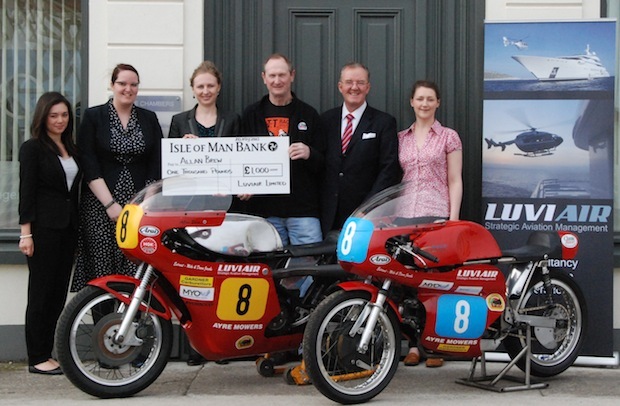 In the photo above the Luviair team is shown presenting a sponsorship cheque for £1000 to Allan. From left to right: Stephanie Spencer, Kerry Walker, Olga Debnam, Allan Brew, Nigel Watson, Mairi Lockwood. Allan’s motorbikes are (left) a Seeley frame with a Matchless G50 500cc engine and (right) a Drixton frame with an Aermacchi 350cc engine.